ხუან სებასტიან ვერონი (ესპ. 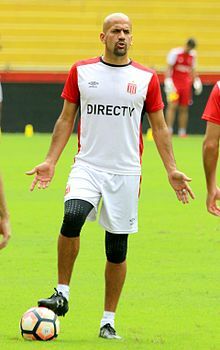 Juan Sebastián Verón; დ. 9 მარტი, 1975, ლა-პლატა) — არგენტინელი ვეტერანი ფეხბურთელი. თამაშობდა ნახევარმცველის პოზიციაზე. ასპარეზობდა არგენტინის, იტალიისა და ინგლისის ჩემპიონატებში. აქვს იტალიის მოქალაქეობა. 1998, 2002 და 2010 წლების მსოფლიო ჩემპიონატების მონაწილე არგენტინის ეროვნული საფეხბურთო ნაკრების შემადგენლობაში. 1996–2010 წლებში იყო არგენტინის ეროვნული საფეხბურთო ნაკრების წევრი, რომლის შემადგენლობაში 73 მატჩი ითამაშა და ცხრა ბურთი გაიტანა. შეგიძლიათ იხილოთ მედიაფაილები თემაზე „ხუან სებასტიან ვერონი“ ვიკისაწყობში. ↑ Sky Sports — Juan Sebastian Veron (Player Details) — Sky Sports წაკითხვის თარიღი: 15 თებერვალი, 2018. ↑ Player Profile for Juan Veron in the Soccer World Cups. Juan Veron in the World Cups. Information about Juan Veron and his performace in the FIFA Soccer World Cup. Profile with general and detailed stats and data that include National Team, total games, goals and cards and full list of matches played. The Soccer World Cups.com. წაკითხვის თარიღი: 15 თებერვალი, 2018. ↑ Héctor Darío Pelayes (16 იანვარი, 2009). Argentine Squads in the World Cups (World Cup 1998). Rec.Sport.Soccer Statistics Foundation. RSSSF. წაკითხვის თარიღი: 12 ივლისი, 2018. ↑ Héctor Darío Pelayes (16 იანვარი, 2009). Argentine Squads in the World Cups (World Cup 2002). Rec.Sport.Soccer Statistics Foundation. RSSSF. წაკითხვის თარიღი: 12 ივლისი, 2018. ↑ Juan Sebastián Verón at National Football Teams წაკითხვის თარიღი: 15 თებერვალი, 2018. ↑ Marcelo Leme de Arruda (6 მარტი, 2004). Pelé's Choice of 125 Living Players. As part of its Centennial commemorations (1904–2004), FIFA asked Pelé to list the 100 best players (still alive) of all-time, comprised of 50 players still in activity and 50 players from the past. Understandably (given that misproportion), Pelé decided to add more players from the past and came up with 125 players in the end, 50 active and 75 retired (but alive) ones. Rec.Sport.Soccer Statistics Foundation. RSSSF. წაკითხვის თარიღი: 27 ივლისი, 2018. ↑ The Guardian (4 მარტი, 2004). The FIFA 100. FIFA today published Pele's list of the 100 greatest living footballers. Compiled to mark the 100th anniversary of the Fifa's foundation, the list is so good it actually contains 125 names. theguardian.com. წაკითხვის თარიღი: 27 ივლისი, 2018. ↑ BBC Sport (4 მარტი, 2004). FIFA names greatest list. Pele has revealed his list of the 125 greatest living players at Fifa's centenary gala in London on Thursday. news.bbc.co.uk. წაკითხვის თარიღი: 27 ივლისი, 2018. ↑ Best Football Players Ever (4 მარტი, 2004). FIFA 100 – list of the 125 greatest living footballers in 2004 created by Pelé for FIFA´s 100th anniversary. The FIFA 100 is a list of the 125 greatest living footballers in 2004 created by Pelé for FIFA´s 100th anniversary. Pele had been asked to select 50 retired players and 50 active players to get a list of 100 players, which would refer to the FIFA´s 100th anniversary. However Pelé found it too difficult to select just 50 former footballers so the list would eventually get to 125 players from which 75 former players. bestfootballplayersever.com. წაკითხვის თარიღი: 27 ივლისი, 2018. ↑ BBC Sport (4 მარტი, 2004). Pele's list of the greatest. These are the 125 players selected by Brazilian legend Pele to mark Fifa's 100th anniversary. Argentina: Alfredo Di Stefano, Daniel Passarella, Diego Maradona, Gabriel Batistuta, Hernan Crespo, Javier Saviola, Javier Zanetti, Juan Sebastian Veron, Mario Kempes, Omar Sivori. news.bbc.co.uk. წაკითხვის თარიღი: 27 ივლისი, 2018.
ეს გვერდი ბოლოს დარედაქტირდა: 12:20, 7 იანვარი 2019.